Strategically located in the heart of the Golden Triangle adjacent the Kuala Lumpur Convention Centre and overlooking and KLCC Park. 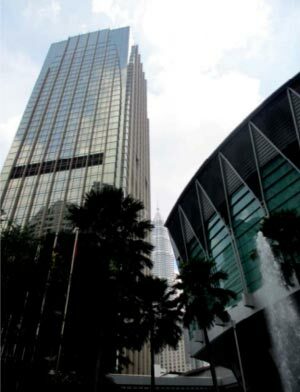 The iconic Petronas Twin Towers and Suria Shopping Centre are located nearby. Easily accessible to the main roads and rail networks (LRT and Monorail). The new air conditioned pedestrian walkway linking the Pavilion and Suria Shopping Centres is accessed from the Kuala Lumpur Convention Centre and directly opposite Menara Darussalam. Menara Darussalam is a prestigious 41 storey tower providing 13 floors of Grade A offices and the 5 Star Grand Hyatt Kuala Lumpur Hotel. Dedicated office entrance with a drop off point and double height atrium. Each floor plate provides efficient office space arranged around a central core. It has a Green Building Index (GBI)Provisional Certified rating. The Grand Hyatt Kuala Lumpur offers 5 Star facilities including restaurants and bars, health, fitness and wellbeing, meeting and event space. Expected to be completed in May 2012.